The gardening club got hold of some rare blue Hopi corn seeds - and planted them up today. These should be ready for August/September. Found primarily in North America's Southwest, blue corn has been a staple food of Native Americans - including the Hopi, Pueblo, Navajo & Zuni tribes - for hundreds of years. Blue flour corn, made of primarily soft starches, is used for blue corn flour & cornmeal, and for making blue corn tortillas and blue corn chips. It’s a bit coarser than yellow or white meal, but is somewhat sweeter & nuttier in flavor. It also contains about 20% more protein & up to 50% more iron than other varieties of corn. The seeds are in the greenhouse until they are ready to go onto the green. They will go on the north side of the main green as this gets the most sun. Not only will they look absolutely stunning - but they will be the tastiest corn you have ever tried. Watch this space!!!! Many thanks to Aliyah & Aamna for this amazing gift to Leabank Square. Together with their cousin - they grew this tree from seed last year - and it's now ready for the edible garden. They planted it in the old fish-pond - where the ground is a bit more fertile - so in a few short years we should be eating their delicious apricots. Thank you both very much for everything you do for Leabank Square - all the dhaniya, corn & onions are delicious - but this apricot tree will be a lovely addition to the edible garden for many, many years! I’m sure you’ll agree the daffs have been a delightful sight after one of the coldest winters in decades! Sadly the blooms are coming to an end but it’s really important that the plants stay in the ground for a few more weeks, for some really important stuff to occur. Leaving the spent daffodil plants in the ground ensures that the energy from the leaves are put back into the bulbs. This means that we’ll have a bigger and better display of daffs next year! A BIG thank you to all the gardeners who were involved in the purchasing and planting of these cheery flowers. How about these pics for a different perspective of the Olympic construction site across the river?! Every day we see the buildings going up higher - but take a few steps backwards - & get to the same height as the Broadcast Centre - and you see just how dinky Leabank Square actually is -compared to that monstrosity!!! This shows just how imperative it is that we fight any move to build on the land directly opposite us! The Leabank Square Gardening Club tackled the Recycled Garden today - and what a massively productive day it was?! After the obligatory cuppa & delicious yum yums - they set about clearing the north bank of all the weeds, grasses and a couple of self seeding sycamore & alder trees. The north bank looks absolutely brilliant now - and we are all thinking very hard about what to do with this space next. Then they planted up the herb seedlings into trays ready for a few weeks nurturing - before transplanting into the edible garden & green. Today they sowed chives, parsley, mint & some peas (earlies). We were so very lucky with the brilliant sunshine - that we did a bit more than was intended - but all felt full of the joys of spring afterwards. Thank you to everyone who turned out today - together we are all making Leabank Square a more loving place to live in! But do we really have any choices? Do we really know who to trust? What comes down with the rain, when it falls? 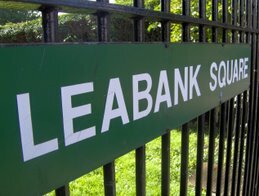 Just a gentle reminder to all residents that the Leabank Square Gardening Club meets again - this coming Sunday 11th April @11am. Everyone & anyone is very welcome to come along & join in. You don't have to be a member yet - just simply turn up on the central green for a lovely cuppa - and we'll tell you all about it. After the delicious cuppa & croissant - we'll all take a stroll around the square - and talk about what is growing where - and how well it's all going. Depending on how many residents turn up - we'll then break into smaller groups - and set about weeding the wildflower meadow we planted up last meeting, tidying the Recycled Garden & planting all the herb seeds. Of course we'll break for a few more cuppas along the way. This meeting is ideal for anyone who has been putting off joining for a while (mainly because of the cold winter) - as spring is the most rewarding time of the gardening calendar. You will see the fruits of your labours in a few short weeks!! So please, please do come along - and tell your neighbours about it too!! Many, many thanks to Tom for this brilliant donation to the Recycled Riverbank Garden!! We have thanked Tome on many occasions for all the help & donations he has given all of Leabank Square - but this is such a fitting donation to the garden. The smaller kids have never really had their own seats to sit on - but now they have a lovely long wooden train to rest on. Tom - thanks for everything you always do for us - you're such a star! !